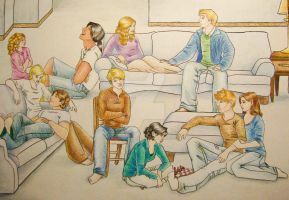 Another drawing of Bella and the Cullens. I'm going to the States in three weeks so I hope to post almost all the works in progress I have now by then. Hi, glad you liked it! As long as you add my name and a link to my page to it, I don't have a problem! i don't much like twilight but the picture is great! very nice picture - full of emotion and much fun to look at! Well this is pretty good! Well done. im interested in the lineart! give me a notice please! wow wow wow wow wow wow wow wow ! i love it! tEAM EDWARD!!!!!!!!!!!!!!!!!!!!! Hii! Glad you liked it!! I'm sorry, but since there wasn't enough interest in the lineart before, I ended up deleting it sorry about that. omg that's sooooo cool! I especially like Alice. Have fun in America! I wanted to draw Bella with red eyes, so that'd explain the reason why Edward is so happy... but then, some people want Bella to stay human so I thought drawing her like that would be middle ground. 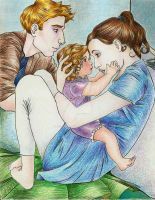 I like how Bella (the human) came out in this picture. She's her typical embarrassed self, but at the same time she looks happy to see Edward happy. I'd like to try though your style and coloring is awesome! yay! I'll send you a photobucket link when I'm done and you can post a copy.